The best place to stay in Brescia is Centro Paolo VI. This is a palace and the prices are amazing value. It would make sense to base yourself in a palace in Brescia and take day trips to Milan, Lake Garda as well as Verona. 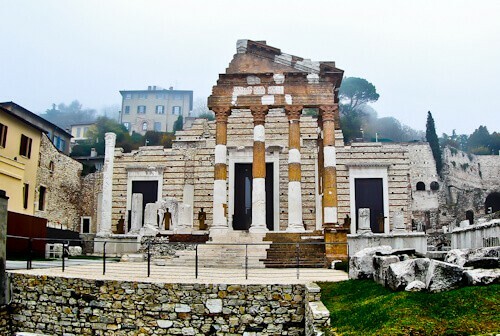 The Capitolium is what remains of the main temple of the ancient Roman city of Brixia (modern day Brescia). The temple is close to 2,000 years old. There’s a YouTube video on how the Capitolium originally looked. You may go inside the temple and view ancient Roman inscriptions and artifacts. Alongside the Capitolium temple are ruins of the Roman theater of Brexia. 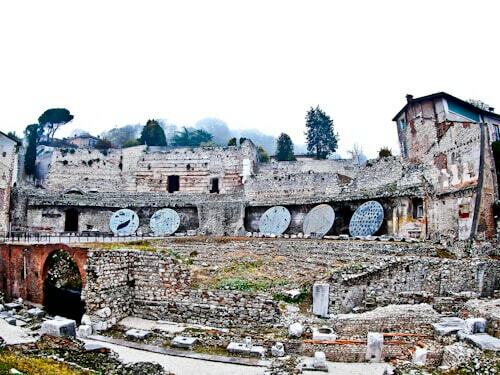 This Roman theater is the second largest in northern Italy. It’s around 2000 years old and could once hold 15,000 spectators. Santa Maria in Soltario is located within the Santa Giulia museum. The church is of Romanesque architecture and dates back to the 12th century. It was the chapel of the nuns. The upper section of the church (above) was used for important ceremonies. 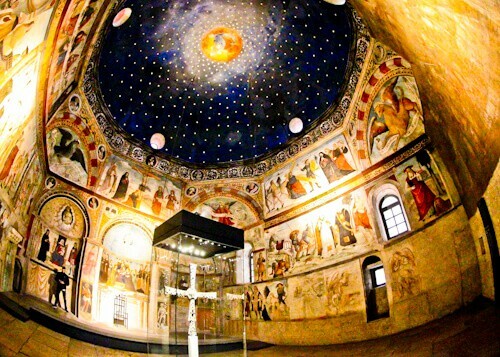 It has unique frescoes which resemble a starry night on the roof. The frescoes are by Italian painter Floriano Ferramola. In the center of the upper church is a huge cross. This was the cross of King Desiderius. He was the the last king of the Lombard Kingdom. The cross is decorated with gems and ornaments from before the 8th century. 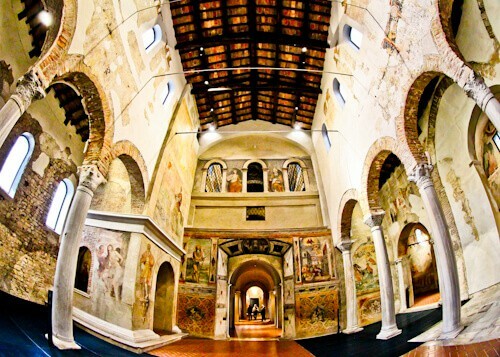 Located in the Santa Giulia museum is the church of San Salvatore. This church is of Medieval architecture. 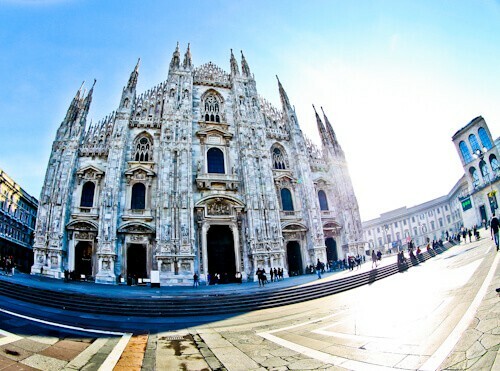 It was founded by King Desiderius in the 8th century and dedicated to the holy saviour (San Salvatore). He brought the remains of martyr Saint Julia here which is who the museum complex is named after. Connected to the church of San Salvatore is the nun’s choir. Nun’s would take part in religious functions from this room, they were hidden from view. This chamber was built in the 15th century. 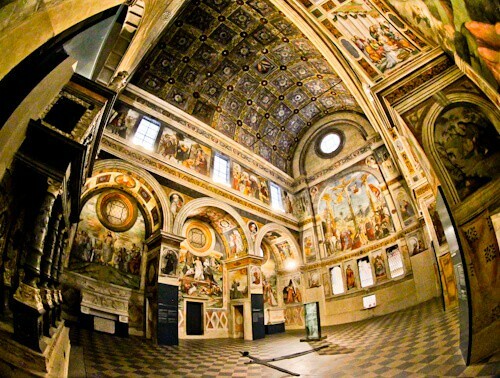 It’s decorated with frescoes painted by Italian artists, Floriano Ferramola and Paolo da Caylina the Younger. The Winged Victory is one of the masterpieces at Santa Giulia museum. 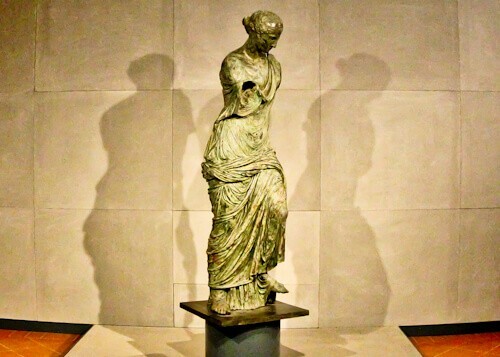 The statue dates back to the first century and is made from bronze. Originally the statue had arms and wings. She was holding a shield written ‘res gestae’. The Romans would portray the goddess of victory with these words. The Winged Victory is an important part of Roman history and can also be seen on Roman coins. The most well known version of The Winged Victory is located in the Louvre, Paris. Brescia has an old and new Cathedral. They’re conveniently located side by side in the center of the city. The new cathedral was completed in the 19th century. At 80 meters in height, it’s one of the tallest in Italy. Inside there is a monument to a former Pope who hailed from Brescia. Pope Paul VI was the Pope during the 60’s and 70’s. The old cathedral dates back to the 11 century. It’s of Romanesque architecture. You won’t see many round shaped churches around the world. 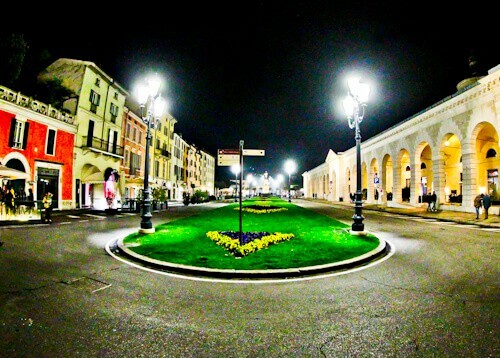 The square which these are located in is lined with restaurants. You can sit out and enjoy a coffee or a meal whilst enjoying the unique view. 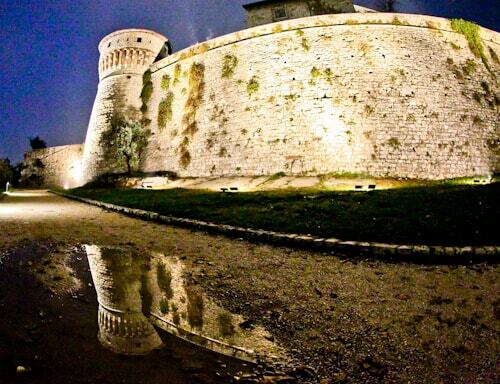 A short walk uphill from Brescia is the Medieval Brescia castle. Entry to the castle grounds is free. There are tunnels, gardens, a drawbridge, fortifications and castle towers. You could spend a whole afternoon taking photos around the castle grounds. 2 museums are located in the grounds. An Arms museum and the Risorgimento Museum. The Risorgimento Museum is about the unification of Italy in the 19th century. From the castle you get wonderful panoramic views of the city of Brescia. Loggia Square is surrounded by Venetian style buildings. At one end of the square is the Loggia Palace. Opposite the Loggia palace is the Brescia clock tower (Torre dell’Orologio, above left). The antique clock dates back to 1546. Another notable building on the square is Monte di Pietà Vecchio (above right). This is beautiful plaza, similar to St Mark’s Square in Venice. One major difference is there are not thousands of tourists. At certain points of the day it’s likely you’ll have Loggia Square to yourself. Victory Square was created in 1932. It was built on what was a run down part of the city. Although not as beautiful as the nearby Loggia Square, it’s still worth a walk through. Piazzale Arnaldo is a picturesque square surrounded by colorful houses. There are lots of cafes and restaurants surrounding the square. 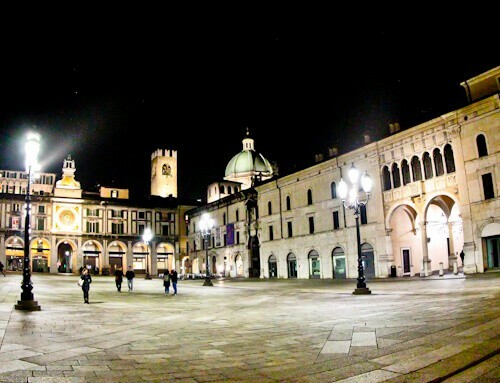 It’s a good place to enjoy the nightlife in Brescia. The drink of choice in Brescia is pirlo. Pirlo is a mix of white wine, campari and soda water. The drink is served with ice. Pirlo is also the surname of the famous Italian footballer who played for AC Milan and Juventus. 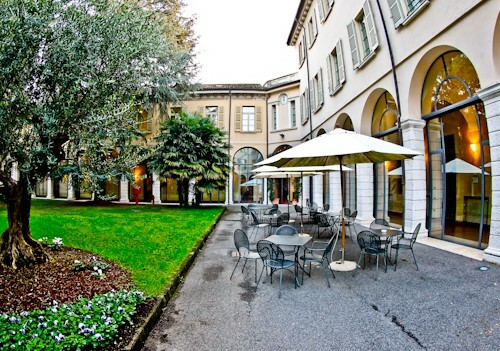 Centro Paolo VI is a hotel palace in the center of Brescia. In the palace grounds is a garden which is perfect to enjoy your breakfast in. Throughout the day you can do as the Italians do, enjoy an espresso or pirlo in the garden. If it’s hot you can take a little shade under an olive tree. The palace houses a private church with famous artwork. In the palace, there are chandeliers, red carpets and rooms with frescoes. 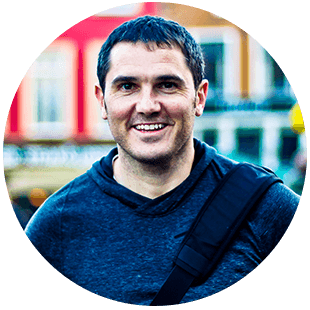 You won’t have a problem filling up your Instagram feed. 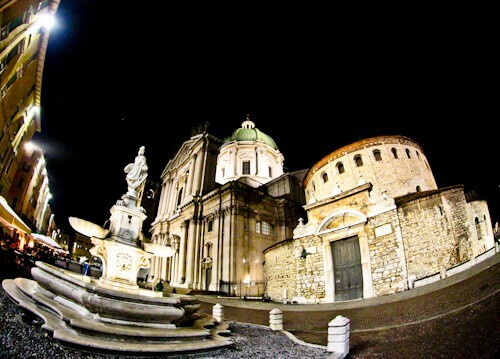 Brescia should be the place where you live like royalty for a few days. What’s the price to stay in a palace? It’s lower than an average hotel in nearby Milan. Check out the Centro Paolo VI review. Brescia is well connected to other cities by train. Milan is less than 40 minutes away to the west. Lake Garda is around 20 minutes to the east. Verona is less than an hour away. Brescia is also served by the Flixbus. The bus station is located in the center of the city, nearby the train station. It’s possible to make day trips with Flixbus to Lake Garda and Verona. 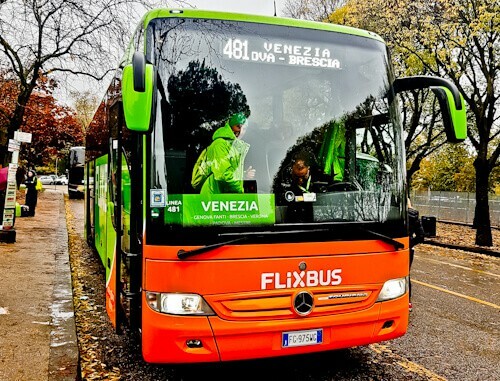 Flixbus have regular buses between Brescia and Verona. The journey takes 1 hour and costs as little as €5 one way. As always with Flixbus, you ride on a clean and modern bus. There is free WiFi and you can charge your phone / tablet. This looks amazing, James! 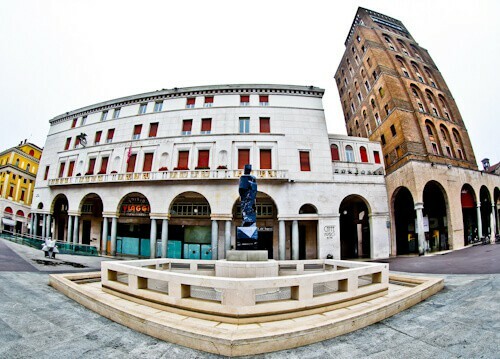 We have been to Milano already but such a shame, never heard of this jewel, Brescia. The Roman Theater looks impressive and actually still in some quite good condition it seems. I always wonder when I see such ruins, how it must have been, 2000 years ago, when 15,000 spectators are yelling, entertained by the shows. But also the old Cathedral looks great, so obviously all in all a place full of history, which makes it a truly interesting place for me to see. Since I plan to visit Italy this summer more often, this will be definitely on my list. Ahhh, another town in Italy that I have to get to. Brescia looks amazing. And we love to use Flixbus for getting around Europe. Such reasonable prices and so easy to connect, not to mention easy to book through their app. Happy New Year. That YouTube video was so interesting! That’s such a smart thing to do when looking at ruins. I’m embarrassed that I hadn’t thought about that until now. Especially helpful when traveling with kids! Yeah man these Flixbusses are such an amazing thing in Europe nowadays! I love traveling with them. Mostly they are pretty comfy and the price is unbeatable. Did not know they go all the way down to Italy as it is a German company, but even better! Those churches look pretty awesome from the inside by the way, great photos! Brescia is actually a hidden gem in Italy. The pictures remained me of my visit to Rome. the basilica dome looked amazing. The blue paint from ancient times only makes it even more interesting. I always wonder how grand everything would have been in the ancient times when the ruins were not ruins and actually a living dream city. Italy is always full of surprises, so much to explore. I love visiting UNESCO sites. My country India has plenty of them. I enjoy visiting Roman theatres. The last one I visited was in Jordan. I didn’t know Brescia has one too? I would lose track of time in Brescia castle. The cherry on the cake is that entry to the grounds is free. It would be exciting to take this bus journey! Would love to go to all of these cities in Italy one day, and it would probably be cheaper for us to drive to Milan and take a FlixBus to Verona and Brescia than pay the tolls on the road, and then go back and get the car! Might have to consider that! Happy New Year! I love your use of wide angle lenses, it really gives a different perspective on places. Brescia is beautiful. Breakfasting in the garden at the Palace looks ideal for a beautiful morning and brushing up on history within stunning architecture would have me ready for an Aperol spritz by evening. Looking forward to Verona! 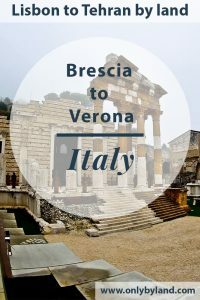 I only know about Brescia because of its football team (pretty how much how I got so good at geography) so it’s awesome to read about it and find out how much there is to do in the city! The incredible ruins, churches and museums would be awesome to explore! 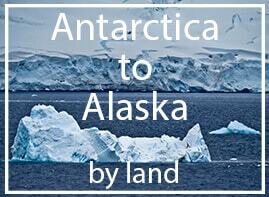 Great that you got to go off the beaten path some more!